"Presented To Miss Brannan As A Token Of Esteem By Former Pupils And Friends On Her Retirement. 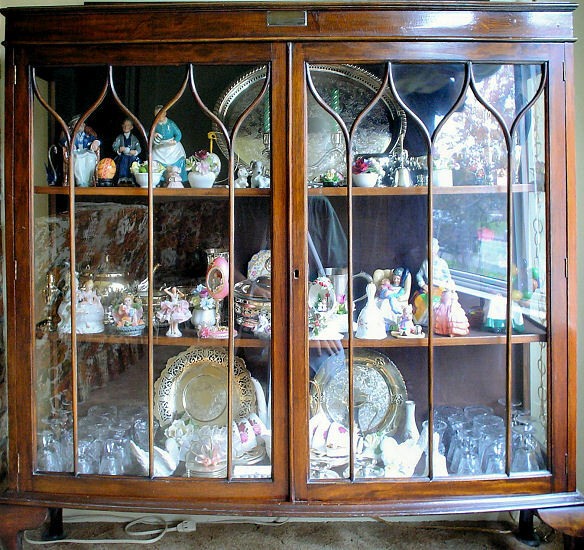 From The Staff Of Cairn School Maybole June 1932"
The cabinet resides in corner in the front room out of direct sunlight (we watch The Antiques Road Show over here as well) and holds my mother's treasures. How the cabinet made it from Scotland to New Westminster, British Columbia is a mystery as is Miss Ann Brannan. Could you please point me in the direction of any sources of information about her. Any info! Photo! Anything! Thanks for your time and attention. After receiving Len's message we did a little research and found that there was a reference in the Cairn School log for 30th June 1932 regarding a Miss Brannan retiring after having given over 40 years faithful service to the school. We checked back to when the school opened in 1890 there is a Miss Mary Brannan in the records. 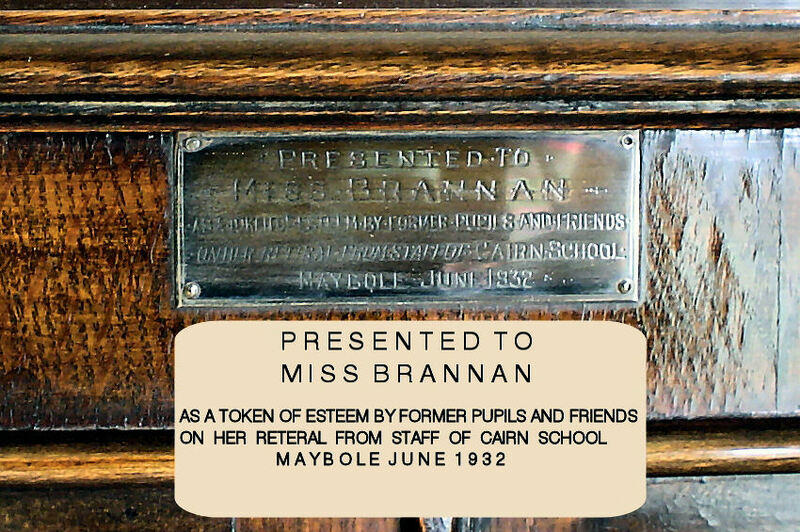 We also checked the Maybole website and found other references to Mary Brannan such as the following from the book Maybole, Carrick's Capital, by the late James Gray. All the schoolteachers lived in the town in days gone past and Miss Duncan, Miss Brannan, "Skin" and "Paddy", if they saw their pupils up to mischief in the evenings were not loth to "belt" them in school the following morning. During the first World War, Miss Mary Brannan, a local school-teacher, organized many concerts to raise money for the war effort, where she, like a local Florrie Ford, led the audiences in spirited choruses of old songs and invariably gave her own inimitable rendering of "The cows are in the clover, they've trampled there since morn, Go and call them Maggie to the old Red Barn". It seems Miss Mary Brannan was a well known citizen of the town and active in civil affairs. 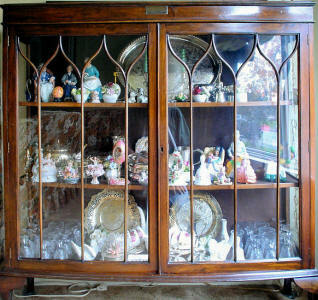 So how did her prize china cabinet come to travel across the ocean to British Columbia? If any of our visitors has an idea please let us hear from you!